Side Window Stickers Five Various Designs Included. These stickers are ideal for driver and passenger windows. Size 9" x 1 1/4"
2. 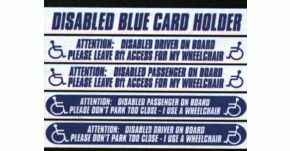 Attention: Disabled Driver On Board. Please Leave 8ft Access For My Wheelchair. 3. Attention: Disabled Passenger On Board. Please Leave 8ft Access For My wheelchair. 4. Attention: Disabled Passenger On Board. Please Dont Park Too Close - I Use A Wheelchair. 5. Attention: Disabled Driver On Board. Please Dont Park Too Close - I Use A Wheelchair. Good clear sticker, as described. Speedy delivery and a easy transaction throughout. Will use company again and recommend.